This week at SweetStamps we have a really special challenge for you. We just recently baptized our goddaughter and what a blessing that was, to be chosen first of all, but to be apart of this beautiful girls life. I have three boys and now having her in our lives, makes it that much brighter. She is actually coming on Thursday and we are super excited!!! Here is a picture of Mariah and I. We took pictures after the baptism and I loved this shot. So my project today was inspired by this day. When I saw the challenge for "Crosses", I knew exactly what I wanted to create. So here is my sample for this weeks challenge. 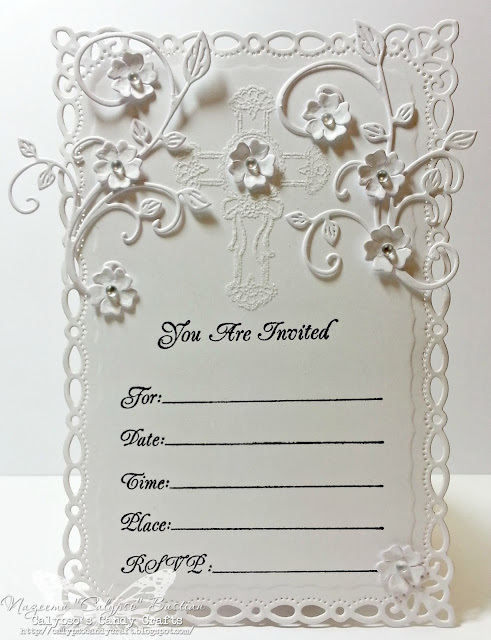 I wanted to create a very delicate, clean and simple invitation. The base of the invitation is a Spellbinder die. The Fanciful Flourish is one of my favorites, by Cheery Lynn designs, along with the flowers which came from Build a Flower #2 Embellishment Kit. Do you see the cross? Isn't that beautiful? I took the Cross-Small and inked it with glue ink and stamped it on the base card. I let that dry for a bit and then sprinkled Glitter Ritz: White over the top and gently rubbed it into the glue. I LOVE this glitter...it's ultra fine and leave such a soft and smooth finish. Then to finish the invitation, I stamped You Are Invited, with Memento Tuxedo Black Ink. This is stunning and just so gorgeous! Hi Calypso, wow and wow again love the picture of you and your god-daughter. Such a cheeky smile and what a gorgeous little outfit too.. Now onto your make and that is equally as stunning. I'm going to get me some of that ultra glitter.. Stunning!! WOW!! I love this invite! So beautiful!! Love the lovely picture as well!! What a sweet picture- your Goddaughter is beautiful in her gorgeous dress and hairbow : ) Oh dear- your invite is absolutely Gorgeous!!! Love all of the fab details!!! Thanks for playing our CAS challenge at 4 Crafty Chicks, nicely done! Simply stunning! I am loving what you did with all of the white, it is so elegant! 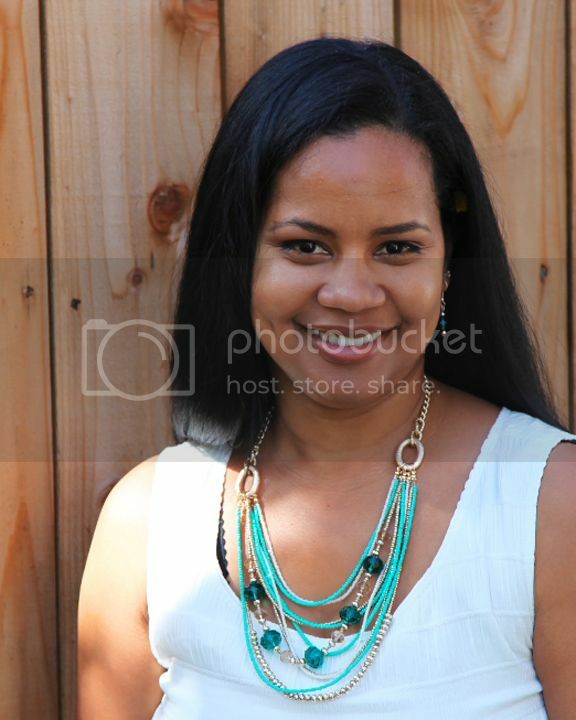 Thank you so much for sharing your fantabulous inspiration with us at 4 Crafty Chicks. Oh my this is just beautiful! What a beautifully elegant invitation. 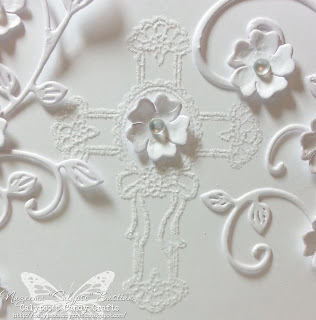 I love the white on white and the cross with the glitter. This is such a beautiful project! 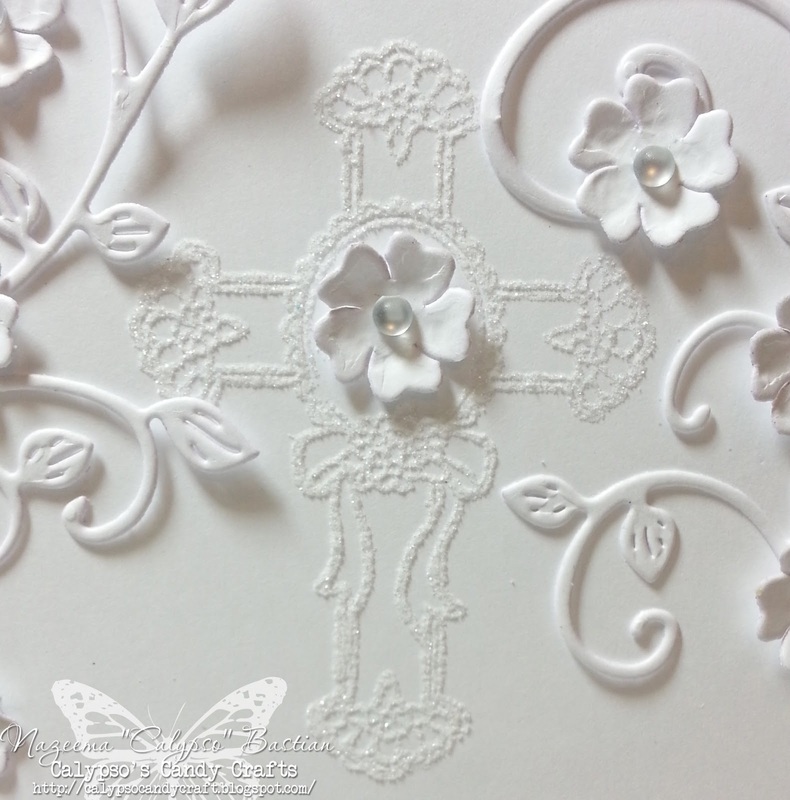 I love the delicate die-cut edges and flourishes and the dainty little flowers... and how you've done the cross. Just gorgeous! Very beautiful monochromatic card! fab! thanks for playing with "osaat" this week! good luck!